Spring has just arrived on Northern hemisphere, this year on the 20. of March. And with the last few weeks of beautiful sunny days (in some regions, like CEE, at least) the nature is slowly waking up from winter hibernation. Depending on the wine growing region, March and April are the months when vines wake up and start to grow on the Northern hemisphere. The season of vine growth is closely linked to the daily air temperature and soil temperature at a depth where most of the roots are located. When in the early spring the average daily temperatures reach 8-12°C, the “vine juices” (water containing a low concentration of organic acids, hormones, minerals and sugars) start to flow (from the root system upwards to the vine parts above the ground). Bud swelling begins when the soil temperature at approximately the depth of 40-60 cm rises to 7-8 °C. At that time vine start to “bleed” which means that “vine juices” starts to drain from the cuts (or “wounds”) on canes and cordons left over from the winter vine pruning. Bud burst on the Northern hemisphere usually starts in late March or early April, if the temperatures are appropriate. That is, when the average daily temperature for a longer period exceeds 10 °C. 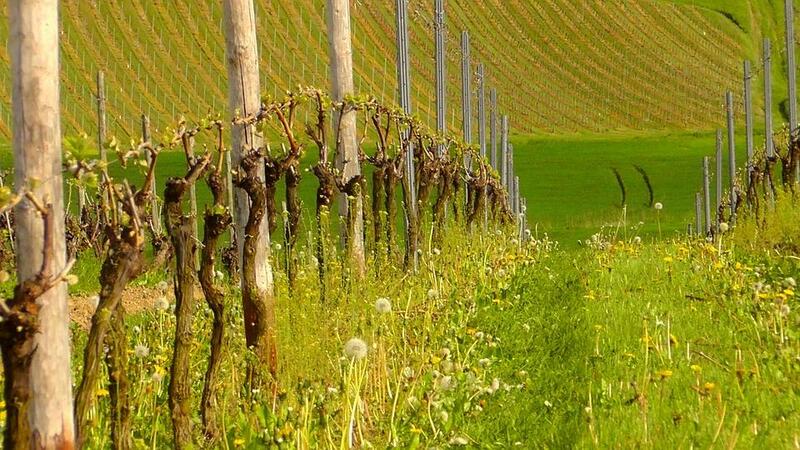 In colder spring, sprouting can be delayed to the start of April or second half of April, depending on the vine growth region. Bud burst starts because “vine juices” start to flow up from the roots towards the buds, which start to swell and force the buds to open – “burst”. During this time, the temperatures are suitable also for the development of most of the vine pests. As soon as bud burst starts and first leafs are unfolded, there is a threat of fungal disease development. Since no grower wants fungal disease on their vines, it’s crucial to suppress vines against primary fungal infections. 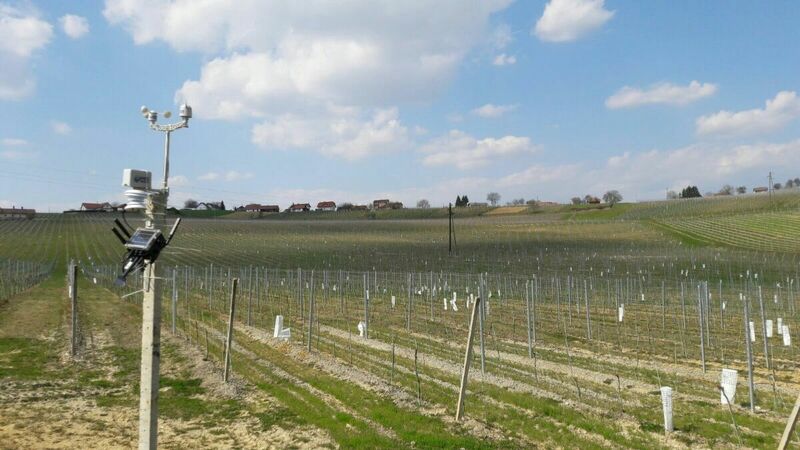 And since we are all responsible to take care for the environment, and no one wants to eat grapes full of pesticides or drink wine full of pesticides, it’s important to spray and protect vines only when the weather is suitable for fungal development. Great way to know exactly when is the appropriate time to protect vines against specific fungal disease is to use decision support system, which helps you to decide the best spray timing. READ ALSO: What to do with the vine prunings after dormant pruning? The amount of rain that falls in spring is closely related to primary infection pressure. Therefore, by knowing the exact amount of rainfall in your vineyard you can decide the best time of spraying, and adjust the times between spraying. On the other hand, spring rainfall is the most welcome to moister soil and give vines the best chance to grow and develop healthy canopies. Since several vine diseases and pests, as well as vineyard maintenance activities, are related to the vine growth phase, it is super useful for the winegrowers to know and calculate growing-degree days (GDDs). GDDs start to calculate at the beginning of growing season, so start of March or April. If you want to learn more about why is it important to calculate GDD in the vineyard, see detailed explanation here. Another reason why it’s best to set up a weather stations in your vineyard in March and April is to give the computer an opportunity to learn about your vineyard, weather in the vineyard and your activities from the beginning of the season. Yes, computers can learn to, with eVineyard. 🙂 More information the computer has about your vineyard and activities in the vineyard, more knowledge absorb and give better and more punctual advice for you and your vineyard.